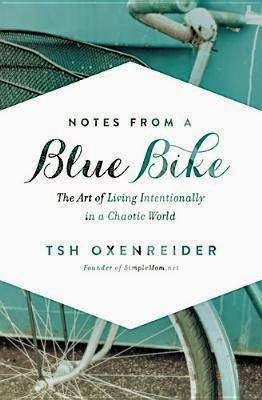 I kept seeing NOTES FROM A BLUE BIKE on the internet but never really looked to see what it was about, in fact I kind of kept ignoring everywhere I saw it. Well one day it caught my attention again and without knowing what it was about I decided to check it out and read it. When I got it I thought oh this sounds interesting. I was sitting in the doctor's office waiting on my husband and dove right in, it grabbed me from page one and I did not want to put it down. Now I started looking more at the cover and the praise for the book and realized that Hey I follow this blog, no wonder I kept seeing so much about the book - duh. Well let me tell you the blog, theartofsimple.net and I encourage you to check it out. To me Tsh and her husband are an inspiration, I applaud them for the way they live. I really enjoyed reading about the travels the family has done and would love it if I could read even more about their time in Turkey. Tsh gives some very good examples on ways to live simply and really makes you stop and think about the things you do in your own life. She also has included some questions at the end of the book to make you think a little more. Another thing that I like about Tsh is that she admits sometimes she makes mistakes and has to change things as she goes - liking deciding where her children are schooled (home vs public vs private). I encourage everyone to pick up this book and give it a whirl as I do not think you will be disappointed. I will even tell you that this is one of the best books I have read all year. Tsh has written a couple of other books as well that I plan to check out.